Book your tournament for 2019 today! Contact the Jackie Smith at 281-356-7700 for your outing quote! High Meadow Ranch Golf Club is one of the premiere daily fee golf facilities in the greater Houston area. Built on the spectacular terrain of southwest Montgomery County of Texas, the course sits inside the rustic country development, High Meadow Ranch. Here you will find land blessed with large stands of native pine trees, towering oaks, dense hardwoods and natural ravines nestled into peaceful surrounds which will lead you to make Houston's High Meadow Ranch Golf Club your golfing home! Embracing the Texas "country charm" and relaxed atmosphere of High Meadow Ranch, the club facilities provide all the amenities necessary for an incredible day of golf. The golf shop is stocked with the very best golf clothing and equipment. The practice facilities feature the High Meadow Ranch Golf Academy. Golf instruction is available from our PGA golf professional staff which offers individual and group golf lessons as well as a variety of golf school instructional packages. To learn more about our Player Development Program, click here. Golf Boards at HMR! Surf the Earth! 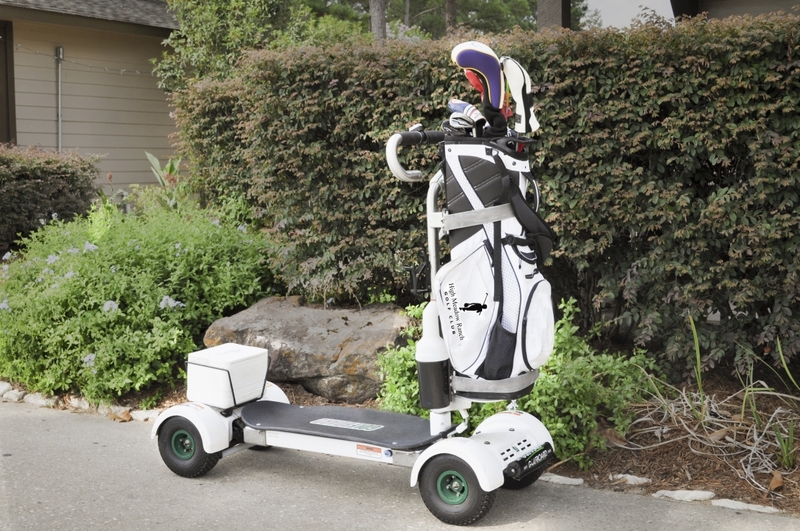 Click on this link to watch a short video and sign the waiver to start golf boarding! Book your next Houston tee time at High Meadow Ranch Golf Club in Magnolia, Texas. Designed by Tim Nugent and former PGA Touring Professional, David Ogrin High Meadow Ranch Golf Club meanders over a magnificent piece of property that is natural and rich in history. Built on the spectacular terrain of southwest Montgomery County, the course sits inside the rustic country development of High Meadow Ranch and features a distinctive routing consisting not of two nines, but three six-hole loops. Aptly named the Forest Loop, Pine Barrens Loop and Signature Loop, the six hole routings provide flexibility for quick golf rounds and has made High Meadow a popular local venue for golf leagues and group outings. The High Meadow Ranch Golf Club facility is home of OGIE’s grill and also offers a 3,000 square foot event pavilion that is a popular venue for Houston corporate parties, social gatherings and post tournament awards banquets. The golf facility at High Meadow also boasts an award winning golf shop that features the very best golf clothing and equipment from the likes of Callaway, Ping, Cleveland Golf, and more. For Houston golfers looking to improve their game, the expansive practice facility at High Meadow Ranch features the High Meadow Ranch Golf Academy. Golf instruction is also available from our PGA golf professional staff which offers individual and group golf lessons as well as a variety of golf school instructional packages. To find out more, head over to The Academy! You are invited to book your next Houston tee time at HighMeadowRanchGolf.com, where the best rate is always guaranteed! Or be sure to ask about the popular Ranch Card and make Houston's High Meadow Ranch Golf Club your golfing home!